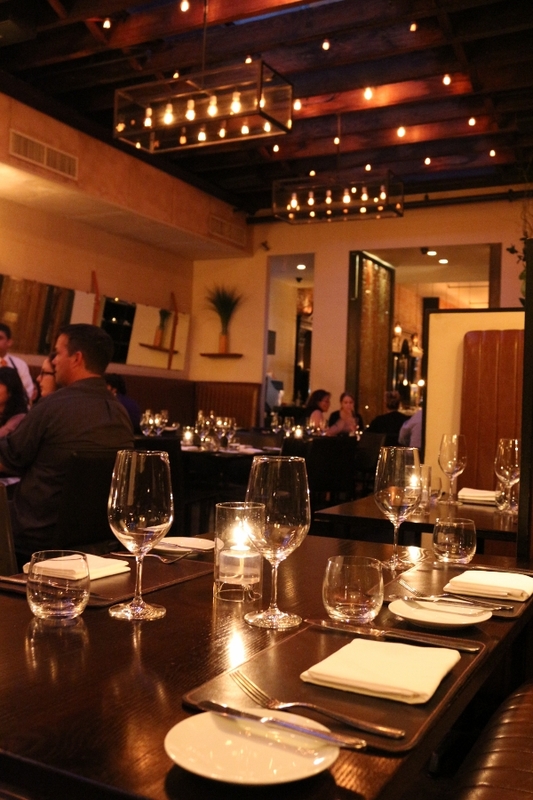 Ever since my first visit to New York City's Scarpetta I have been recommending it left and right to friends of mine visiting the city. Any of them who have taken me up on my suggestion have been impressed by the food and service. Although I'm not the biggest fan of Scott Conant's TV personality, he certainly has skills in the kitchen, as is evident in his restaurants and recently released cookbook (which I love by the way, and will perhaps discuss in the future). On a recent trip to the Big Apple, I figured it was about time for me to return to this fine Italian eatery in the Meatpacking District, tucked away on 14th Street. Nick, one of my New Yorker foodie friends was meeting me here for dinner to catch up since my last visit. He's Italian and had been wanting to try Scarpetta for a while. This was the perfect chance! First thing's first: cocktails. I don't always order booze when I go out to eat. Mainly because I find that in a fine dining establishment if I start to get a little tipsy, I can't enjoy my food as much because my senses are dulled. When I go out to eat with Nick, however, all bets are off. We drink. Not necessarily a lot, but it happens. During this meal we each enjoyed a couple drinks a piece. We both fell in love with one of the specialty cocktails called San Remo. 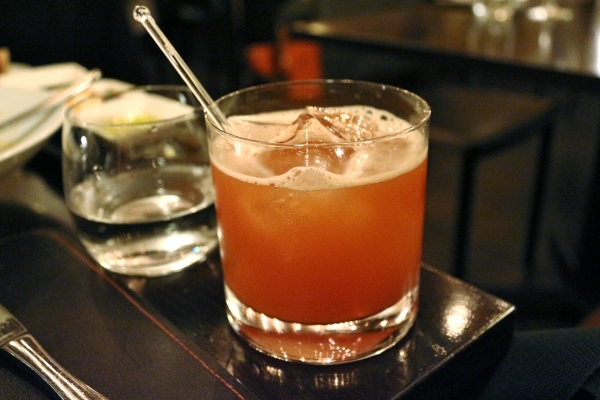 It features Campano Antica (sweet vermouth), Campari (bitter orange liqueur), St. Germain (elderflower liqueur), Michter's bourbon (or Maker's Mark as the cookbook suggests), and orange, lemon, and lime juice. The result is a slightly bitter citrusy drink that tastes almost exactly like an alcoholic grapefruit, from the bitter pith to the tart juice. It's kind of spectacular. Fortunately the recipe is available in The Scarpetta Cookbook and as soon as I build up my home bar with some more of these spirits I plan on making this myself! 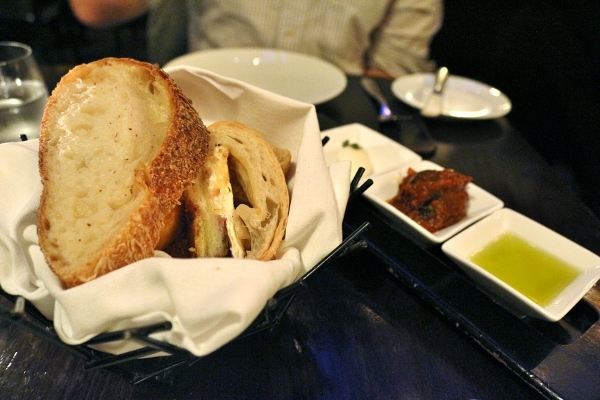 Onto the bread basket, which is another one of my favorite things about Scarpetta. It is a truly stellar bread basket which contains a variety of breads, from focaccia to stromboli (with all recipes available in the cookbook... score!). On top of that, sides of mascarpone butter, eggplant caponata, and citrus-herb olive oil elevates this bread offering even further. As much as one tries not to fill up on bread, it's so hard to stop when the bread and spreads are as good as these! Nick and I split a couple starters. The Creamy Polenta with Fricasee of Truffled Mushrooms was a repeat from my last visit, but it will make it onto the table time and time again because it's so ridiculously good! 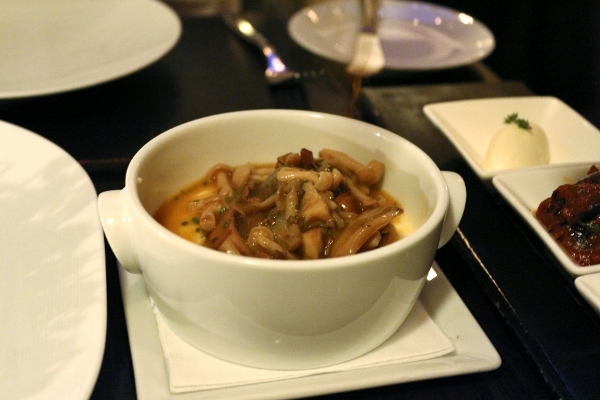 Hot, decadently creamy polenta is served table-side with a topping of the stewed mushrooms. Whether you try the polenta and mushrooms on their own or as a combination, this dish is one of my all-time favorites anywhere. The recipe is in the book too and answers a lot of questions about why it's so good: Conant uses a combination of heavy cream, whole milk, butter, and Parmigiano-Reggiano to make the polenta. Heaven! 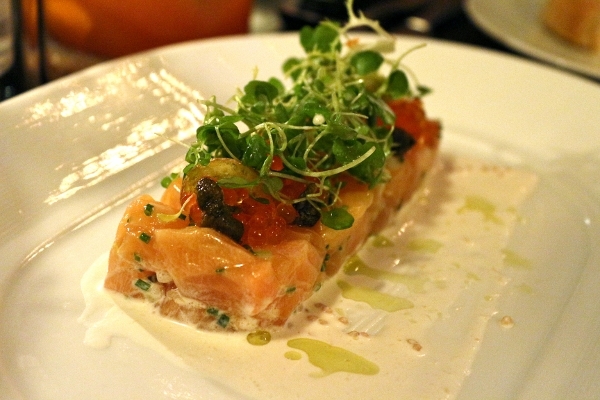 We also decided to try the Arctic Char Tartare, served with marinated cucumber, creme fraiche, trout roe, and fried capers. It has a beautiful texture and a lovely, complex flavor. It's freshness is a perfect foil to the richness of the polenta we were having. 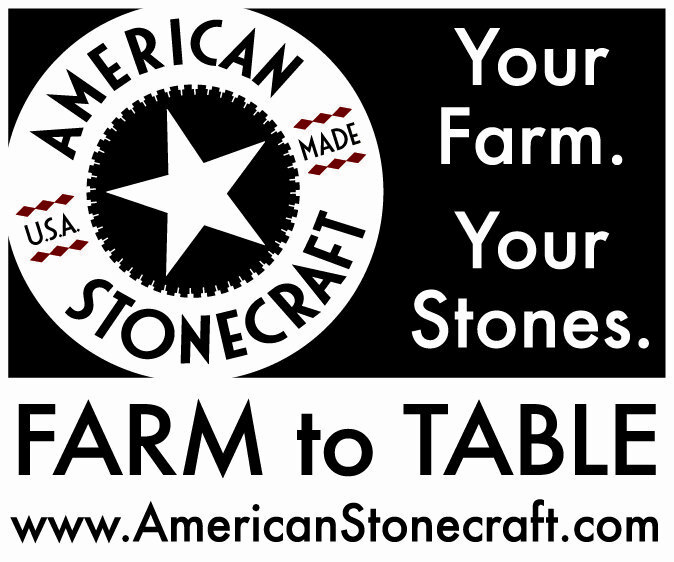 It has the right amount of acid and salt and isn't heavy at all, even with the creme fraiche. This is a great variation of a fish tartare. For entrees we went halfsies on a couple homemade pasta dishes. 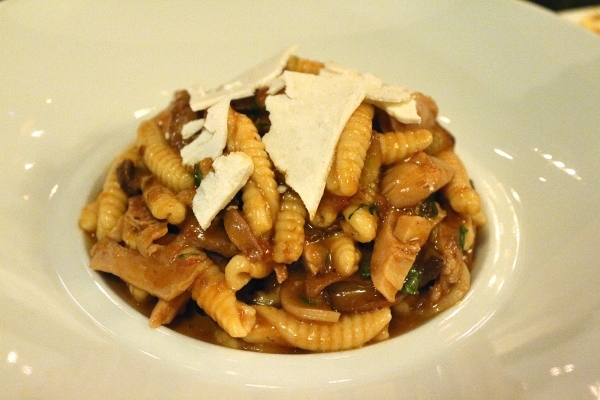 The first is the Cavatelli with Rabbit, Porcini, and Arugula. The pasta itself is apparently made with ricotta cheese (once again, I learned this from the book!). 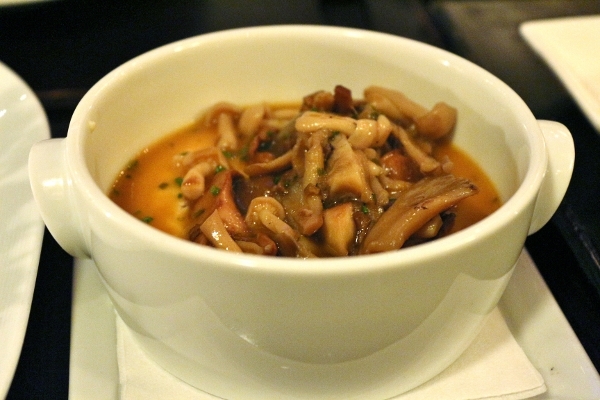 The rabbit ragu is a fabulous addition to the tender pasta and mushrooms. They use fresh porcinis, which is pretty awesome because most cooks don't have access to the fresh stuff, only the dried versions. Just as I fell in love with the Spaghetti with Tomato and Basil on my previous visit, this Cavatelli is picture perfect. 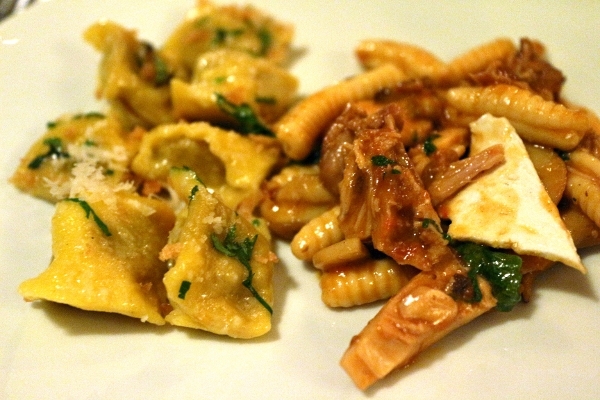 Our second pasta dish is Short Rib and Bone Marrow Agnolotti with Garlic Chips and Horseradish. 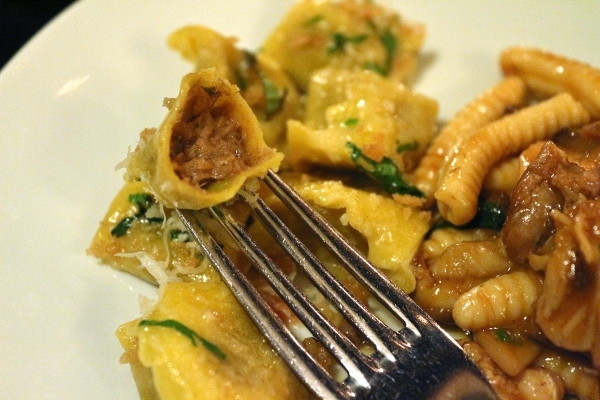 These adorable little pasta pockets are filled with the most decadent and succulent meat around. 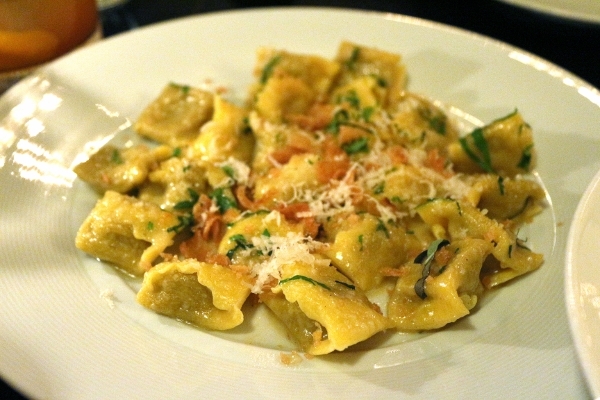 A combination of both juicy short rib and unctuous bone marrow makes these agnolotti really shine. A horseradish brown butter sauce finishes the dish along with crunchy bread crumbs. I can't select a favorite between these two pastas (or even three if you count the spaghetti from last time). All I can say is, you won't be disappointed with whatever you pick. 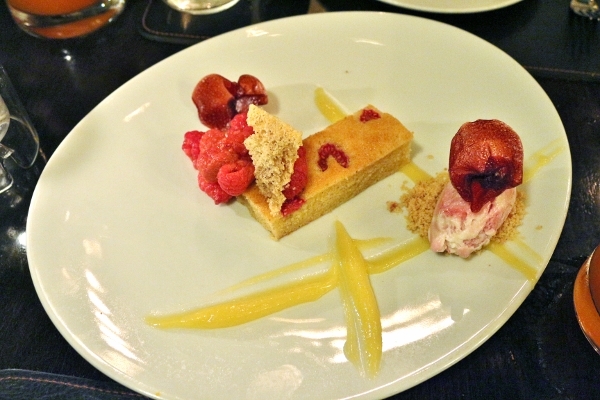 For a sweet finish we tried the Raspberry Torte, which features key lime curd and white chocolate-raspberry gelato. It's a light cake with great citrus flavor along with the raspberries. This dessert is simple and somewhat rustic, but served in an elegant enough way that is fitting of a restaurant like Scarpetta. After our incredibly satisfying meal we still managed to get a bit of sticker shock when the final bill arrived! I guess that's what happens when you have multiple cocktails each, multiple appetizers, entrees, and dessert without doing any math along the way. Oops! We still have no regrets. The meal was fantastic and despite what turned out to be a stiffer price tag than originally anticipated, I would return and will continue to recommend this spot to friends and readers.